Romantic dinners are dull, so why not spend your Valentine’s at a cooking class? The question then is – cooking at home is pretty much an everyday occasion for most of us, so how do we make it both fun and romantic? Easy – we go to a cooking class! On a mission to find something challenging for couples, I stumbled up Recipease – another ingenious invention of the UK’s favourite chef (whether it’s fair or not), Jamie Oliver. Recipease’s team of chefs offer easy and fun 2-hour lessons, ranging from spicy Thai curries to hand-made pasta dishes. I selected a sushi lesson, simply because my boyfriend had always admired Japanese cuisine and wanted to learn how to make rolls and dips at home. The place itself was very busy, as we were practically cooking in an open-plan kitchen in front of other non-cooking customers. 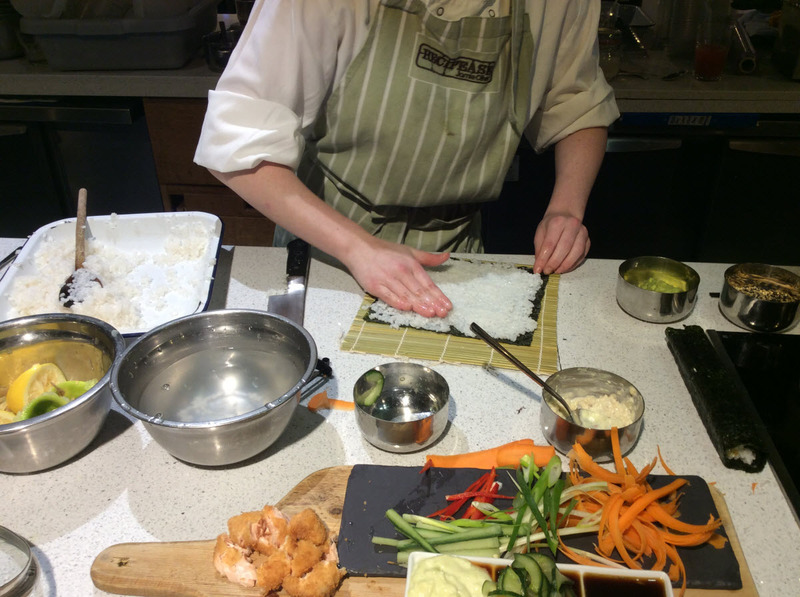 Each couple received a set of ingredients, with instructors explaining easy tricks to a group of complete sushi newbies. Top trick: Our chef taught us to spread rice with our fingers, dipping them in a bowl of cold water every few seconds to avoid rice becoming too sticky. Cooking aside, did you know that real sushi chefs spend seven (SEVEN!!!) years, learning how to cook rice to perfection? And then another three, polishing their cutting/chopping skills. Ouch! As you would expect from Jamie, everything was a bit messy (we were encouraged to go wild), very British (crispy bacon instead of fresh tuna and A LOT of mayo) and super-efficient (in 2 hours we each managed to make 6 rolls, 3 dips and a salad). Technical knowledge aside, it is truly incredible, how much you can find out about your partner whilst cooking – couples’ therapy, compared to this, is a waste of money! In a short space of time, we had to become an efficient and creative team, bouncing off ideas and splitting tasks. Afterwards, when all our rolls were cut and decorated, they sat us down at the restaurant…and even brought us a candle (see, romance!). Agreed, not what you would typically imagine as your ideal Valentine’s Day dinner, but very rewarding and bonding. Wherever you are in the world, I strongly recommend checking out your favourite restaurants for cooking lessons. Valentine’s is already full of clichés we all hate, so let’s break the pattern and do something different this year.